But not all credit counselors are the same. In fact, there are some real scam artists out there, and we want to give people a heads up about what to look for when trying to find a legitimate credit counseling agency. A credit counselor cannot get a creditor to forgive your debt or even reduce the amount of principal you owe. If you see a counselor advertising that they can make “debt disappear” for pennies on the dollar, then you should turn and run in the other direction. A nonprofit credit counselor will typically charge a fee, but they do not operate to make a profit. Instead, they operate to help inform and assist the public. The Federal Trade Commission recommends that you choose a non-profit credit counselor over a for-profit entity. Once you find a credit counseling agency, ask it to send you any free information about the services it provides. They should be willing to send this information without requesting personal information from you. To check whether they are legitimate, you can look at the Better Business Bureau or for complaints online. Look to see what people are saying about the services. A history of complaints—particularly complaints about feeling ripped off—are huge red flags that you should pay attention to. Very few credit counselors provide services for free. Before signing up, ask what fees they charge. You should also get a fee agreement in writing and read it carefully. If you have questions, ask them now. You should also comparison shop. If there are several credit counseling agencies in your area, ask for fee information from all of them. You can then choose the option that is most in line with your budget. Credit counseling cannot solve all problems, especially when consumers are struggling with a lack of income coming in the home. If your financial condition is dire, then filing a consumer bankruptcy might be more ideal. 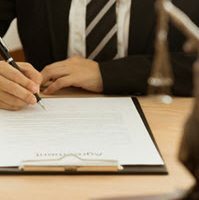 At Nowack & Olson, our bankruptcy attorneys have filed countless Chapter 7 and Chapter 13 bankruptcies for clients, and we understand the process inside and out. For more information, please contact one of our attorneys by calling 866-907-2970 or submit our online contact form.